1. The Saxons who are the bad guys of the Arthurian stories magically turn into good guys in 1066 when the nasty Normans invade. Then they turn into the English and become bad guys again. 2. The Scots, kilted up as Mel Gibson lookalikes, can do no wrong. 3. King John is always a bad ruler. 4. In any novel prior to 1970, Richard III is an evil child-murdering hunchback. Post-1970, he turns into a wonderful guy, completely innocent of the murder of his nephews and with a back as straight as a ramrod. Henry VII takes over as the bad guy. a stupendous shade of auburn. 6. At least once in any novel the hero will be wounded and the heroine, a skilled herbwife, will be called upon to tend him. 7. The villain of the piece or his henchman will frequently have disgusting table manners and disfiguring scars. 8. The hero is never bald or a serf – unless the novel is a work of literary fiction, in which case the latter is a necessity. The hero of the first statement is likely to parade around in his armour even when relaxing at home and will wear his sword as a matter of course. 10. No hero is ever called Etheldred, Cuthbert, Archibald or Baldric. No heroine is ever called Hegelina, Frideswide, Euphemia or Hildegarde. In certain works aforementioned at point 9, the hero will be called Blade, Hawke, Addis or Bryce while the heroine will be named Adrienne, Rainna, Mellyora (I kid you not!) or Elissa. Authors will often have very similar stage names to those of the heroine and their work will be given 4 stars by Romantic Times. 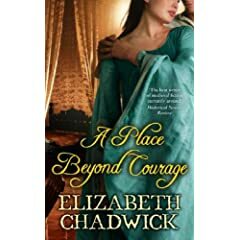 Elizabeth Chadwick is the author of many fine historical novels set in the Medieval era, the latest of which is A Place Beyond Courage (2007)which features John Marshal, father of William Marshal, about whom she has published two novels, The Greatest Knight and The Scarlet Lion. She says: “I put a brutal hunting scene in my first novel The Wild Hunt. I’ve not been as graphic since. My characters still go hunting, but in a more understated way. I have considered being subversive and writing an Arthurian novel from the poor, maligned Anglo-Saxons’ viewpoint, but that’s still on a back burner. At least these days the heroines DO get pregnant. When I was in my teens and early twenties, you’d have thought they were all on the Pill, the number of frolics they had without suffering the consequences!” Elizabeth Chadwick's blog is Living the History.